Furniture « Global Market Insights, Inc. Considering the remarkable contribution of paints & coatings across myriad industrial domains, painting tools market is gaining popularity across the construction, automotive, packaging, and wood coatings sectors to fulfil the requirement of aesthetics via paint application. The advent of automation and the numerous technological advancements coming to the fore by the day have led to the introduction of improved painting techniques. For instance, various automotive giants have of late, attempted to implement robot assisted paint shops, subject to the complications arising in the manual painting process. 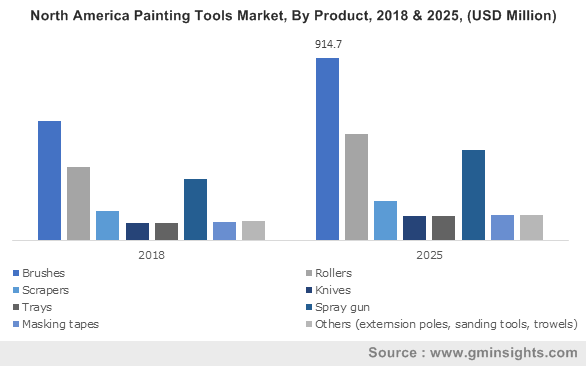 In addition, robotic painting also reduces the elements of excess labor and toxicity, owing to which companies have been trying to invest in and commercialize robots for industrial painting, thereby augmenting painting tools market share. Such advancements in the operational processes may lead to an increase in productivity and enable convenient utilization of painting techniques, thereby boosting painting tools industry over the years ahead. As per recorded statistics, in 2016, painting tools market generated a revenue of USD 9.3 billion. 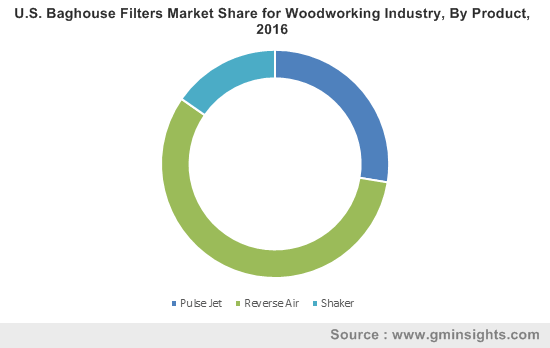 Growing industrialization and urbanization across the various regions of the globe are likely to fuel the demand for painting tools. Brushes, rollers, gun sprays, etc., are some of the crucial and commonly used painting tools. Various regional governments and private organizations across the globe have been investing heavily in infrastructure developments, subject to the requirement for paints that will prevent chemical attacks, abrasion, and enable protection from UV rays. Nowadays, different types of coatings are available for different kinds of surfaces, which necessitates the requirement of various types of tools. Increasing usage of paints is thus, likely to favor global paints and coatings market, and by extension, will impel painting tools industry share noticeably. Apart from the construction, the product finds applications in the automotive sector as well. Various automotive manufacturing companies such as Audi, Volkswagen, Opel, BMW, and Mercedes-Benz have been using painting tools to improve the appearance of the vehicle via painting. In 2016, automotive sector contributed USD 550 million to the overall painting tools industry share. The products are prominently used across Germany, since the region has a strong base of automotive giants. Statistics claim Germany to have covered around 15% of Europe painting tools market share in 2016. Industrial painting is a rather complex process and requires the usage of highly efficient tools. Painting tools industry giants have been focusing on development of eco-friendly and efficient spraying tools of late, to ease the process of painting. In fact, the electrostatic manual spray gun is one of the emergent technological advancements in spraying tools. With the introduction of new advanced materials such as the Graco designed FRP based spray gun, which is light, reliable, and low maintenance, the complications in the painting process for automobiles has considerably been reduced. Pertaining to the increasing demand for spray guns in automotive applications, painting tools market size from spray guns will exceed a revenue collection of USD 3000 million by the end of 2024. Industry giants are engaging in strategic collaborations and mergers & acquisitions to widen their customer base across numerous geographies. The key players in painting tools market are Braun Brush Co., Gordon Brush, Richard Tools, EPOS Egypt, Dura Paints, Purdy®, Milton Brushware, MAAN, Mill-Rose Company, Nespoli Group S.p.A, USA Tools, Anderson Products, Shawky Brush & Roller Factory, Harbor Freight Tools, Makinah, and Allway Tools, Inc. This entry was posted in HVAC and Construction and tagged Appliances, Automotive, Brushes, Construction, Edge Painting Tool, Furniture, Industrial Machineries & Equipment, Knives, Masking Tapes, Packaging, Painting Tools Market, Painting Tools Market Size, Painting Tools Market Trends, Rollers, Scrapers, Spray Gun, Trays, Wall Painting Tools.